On August 9, it became publicly known that the U.S. and Cuba had been and still are engaged in a diplomatic dispute. Is it a spat or something more serious? Here are details about what started becoming publicly known only yesterday. In the fall of 2016, several U.S. diplomats at the U.S. Embassy in Havana began suffering unexplained losses of hearing, and some of the diplomats’ symptoms were so severe that they were forced to cancel their tours early and return to the U.S.
On February 17, 2017, the U.S. informed Cuba about these medical problems. Apparently sometime in or about May 2017, the U.S. investigation of these medical problems concluded that the diplomats had been exposed to a device that operated outside the range of audible sound and had been deployed either inside or outside their residences. It was not immediately clear if the device was a weapon used in a deliberate attack, or had some other purpose. 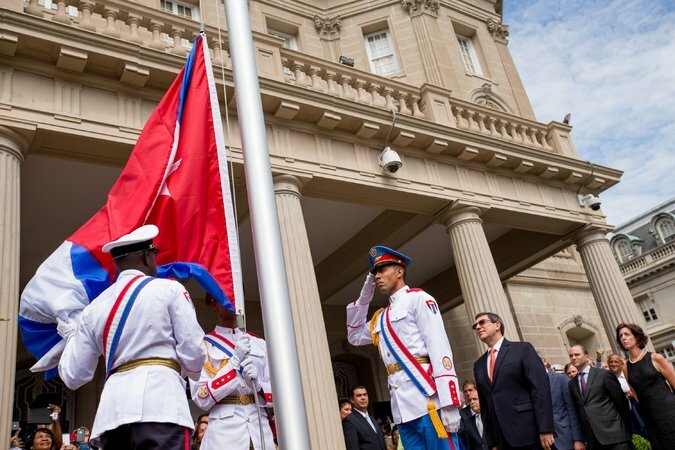 On May 23, the U.S. asked two Cuban diplomats at the Cuban Embassy in Washington, D.C. to leave the U.S., and they did so. On August 9, the U.S. State Department reported that the U.S. had expelled two Cuban diplomats at its Embassy in Washington, D.C. for unspecified “incidents” in Havana. In response later the same day, Cuba’s Foreign Ministry released a statement that the expulsion of the Cuban diplomats was “unjustified and unsubstantiated” and that : “Cuba has never, nor would ever, allow the Cuban territory to be used for any kind of action against accredited diplomats or their families.” In addition, it said, “It reiterates its willingness to cooperate in the clarification of this situation” and had started a “comprehensive, high-priority and urgent investigation” into the alleged incidents after it had been informed of them by the embassy in February. The statement also reported that Cuba had reinforced security around the U.S. embassy and U.S. diplomatic residences. Apparently also on August 9, a U.S. government official said several colleagues at the U.S. embassy in Havana had been evacuated back to the U.S. for hearing problems and other symptoms over the past six months (February-July?). Some subsequently got hearing aids, said the official, who spoke on condition of anonymity. U.S. officials also told the Associated Press that about five diplomats, several with spouses, had been affected and that no children had been involved and that the FBI and Diplomatic Security Service are investigating. The officials also stated that investigators were looking into the possibilities that the incidents were carried out by a third country such as Russia, possibly operating without the knowledge of Cuba’s formal chain of command. Everyone needs to stay tuned for further developments and hope that this does not lead to a further deterioration of relations between the two countries. The apparent medical problems experienced by spouses of U.S. diplomats suggests that if the problems were caused by some kind of electronic device, the devices were located at the diplomats’ homes, not the Embassy. Especially with the current legitimate concern over the U.S. avoiding provocative statements about North Korea, both the U.S. and Cuba need to exercise restraint, to work together to solve these problems and to avoid jumping to conclusions before the results of investigations are known. Senator Marco Rubio has not exercised such restraint with his August 9 press release: “The Cuban government has been harassing U.S. personnel working in Havana for decades. This has not stopped with President Obama’s appeasement. Personal harm to U.S. officials shows the extent the Castro regime will go and clearly violates international norms.” Calm down, Marco. Reuters, Cuba Denies Involvement in Incidents Concerning U.S. Diplomats, N.Y. Times (Aug. 10, 2017); Reuters, Cuba Says Investigating ‘Incidents’ Concerning U.S. Diplomats in Havana, N.Y. Times (Aug. 10, 2017); Assoc. Press, Hearing Loss of US Diplomats in Cuba Blamed on Covert Device, N.Y. Times (Aug. 10, 2017); U.S. State Dep’t, Press Briefing (Aug. 9, 2017); Gearan, U.S. expelled two Cuban diplomats after embassy employees in Cuba developed unexplained ailments, Wash. Post (Aug. 9, 2017); Cuban Foreign Ministry, Statement (Aug. 9, 2017); Cuba Foreign Ministry, Cuban Ministry of Foreign Affairs issues statement addressing allegations by the U.S., Granma (Aug. 10, 2017). Rubio Statement on Castro Regime Harming U.S. Diplomats in Cuba (Aug. 9, 2017). Before U.S. Secretary of State John Kerry gave his remarks at the August 14, 2015, formal opening of the U.S. Embassy in Havana, Cuba-American poet Richard Blanco gave a beautiful rendition of his beautiful poem that was commissioned by the U.S. State Department for the occasion: “Matters of the Sea” or “Cosas del Mar.” Appropriately as he spoke one could see the blue Caribbean Sea behind him in the YouTube video of the reading. “Matters of the Sea/Cosas del Mar” is the title of a bilingual chapbook of his poems to be published this September by the University of Pittsburgh Press. 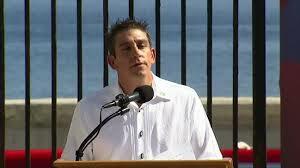 On January 21, 2013, Blanco read another of his poems–“One Today”–at the second inaugural of President Barack Obama. Commissioned by Obama, this poem is the lead poem of another collection of Blanco’s poetry. Soon after his Cuban parents fled Cuba, Richard was born in 1968 in Madrid Spain. Two months later, they all moved to the U.S. and eventually settled in Miami Florida where Richard grew up. In addition to being a writer, he is professional civil engineer. NPR, Poet Richard Blanco on U.S., Cuba: ‘We all Belong To The Sea Between Us” (Aug. 14, 2015); Whitefield, Poet Richard Blanco speaks of the sea and hope in Cuba, Miami Herald (Aug. 14, 2015); Geoffroy, WATCH: Gay Poet Richard Blanco Read His Poem “Matters of the Sea” at U.S. Embassy Opening in Cuba, Towleroad (Aug 14, 2015); American poet, Blanco, urges U.S., Cuba ‘to breathe together, to heal together,’ YouTube (Aug. 14, 2015); Lilly & Naverez, Cuban-American Richard Blanco: We All Belong to the Sea Between Us, NBC News (Aug. 14, 2015); Richard Blanco: Made in Cuba, assembled in Spain, imported to the USA; Poet, Richard Blanco. Univ. Pittsburg Press, Inaugural poet commissioned to write poem for Friday’s Cuban embassy ceremony; Univ. Pittsburg Press, Matters of the Sea/Cosas del mar.